SPEECH AT INDIANAPOLIS. - ARRIVAL AND SPEECH AT CINCINNATI. - SPEECH AT COLUMBUS. - SPEECH AT PITTSBURG. - ARRIVAL AND SPEECH AT CLEVELAND. - ARRIVAL AT BUFFALO. - AT ROCHESTER AND SYRACUSE. - AT ALBANY. - SPEECH AT POUGHKEEPSIE. - IN NEW YORK. - REPLY TO THE MAYOR OF NEW YORK. - IN NEW JERSEY. - ARRIVAL AT PHILADELPHIA. - SPEECH IN PHILADELPHIA. - AT HARRISBURG. - ARRIVAL AND RECEPTION AT WASHINGTON. MY FRIENDS: No one not in ray position can appreciate the sadness I feel at this parting. To this people I owe all that I am. Here I have lived more than a quarter of a century; here nay children were born, and here one of them lies buried. I know not how soon I shall see you again. A duty devolves upon me which is, perhaps, greater than that which has devolved upon any other man since the days of WASHINGTON. He never would have succeeded except for the aid of Divine Providence, upon which he . at all times relied. I feel that I cannot succeed without the same Divine aid which sustained him, and on the same Almighty Being I place my reliance for support; and I hope you, my friends, will all pray that I may receive that Divine assistance, without which I cannot succeed, hut with which success is certain. Again I bid you all an affectionate farewell. The people, when they rise in mass in behalf of the Union and the liberties of their country, truly may it be said, " The gates of hell cannot prevail against them." [Renewed applause.] In all trying positions in which I shall be placed and, doubtless, I shall be placed in many such my reliance will be placed upon you and the people of the United States; and I wish you to remember, now and forever, that it is your business, and not mine; that if the union of these States, and the liberties of this people shall be lost, it is but little to any one man of fifty-two years of age, but a great deal to the thirty millions of people who inhabit these	United States, and to their posterity in all coming time. It is your business to rise up and preserve the Union and liberty for yourselves, and not for me. FELLOW-CITIZENS OF THE STATE OF INDIANA: I am here to thank you much for this magnificent welcome, and still more for the generous support given by your State to that political cause which I think is the true and just cause of the whole country and the whole world. Solomon says there is "a time to keep silence," and when men wrangle by the mouth with no certainty that they mean the same thing, while using the same word, it perhaps were as well if they would keep silence. The words "coercion" and "invasion" are much used in these days, and often with some temper and hot blood. Let us make sure, if we can, that we do not misunderstand the meaning of those who use them. Let us get exact definitions of these words, not from dictionaries, but from the men themselves, who certainly depreciate the things they would represent by the use of words. What, then, is "Coercion?" What is " Invasion?" Would the marching of an army into South Carolina, without the consent of her people, and with hostile intent towards them, be "invasion?" I certainly think it would; and it would be "coercion" also if the South Carolinians were forced to submit. But if the United States should merely hold and retake its own forts and other property, and collect the duties on foreign importations, or even withhold the mails from places where they were habitually violated, would any or all these things be "invasion" or "coercion?" Do our professed lovers of the Union, but who spitefully resolve that they will resist coercion and invasion, understand that such things as these on the part of the United States would be coercion or invasion of a State? If so, their idea of means to preserve the object of their affection would seem exceedingly thin and airy. If sick, the little pills of the homoeopathists would be much too large for it to swallow. In their view, the Union, as a family	relation, would seem to be no regular marriage, but a sort of " free-love'* arrangement, to be maintained only on " passional attraction." By-the-way, in what consists the special sacredness of a State? I speak not of the position assigned to a State in the Union, by the Constitution; for that, by the bond, we all recognize. That position, however, a State cannot carry out of the Union with it. I speak of that assumed primary right of a State to rule all which is less than itself, and ruin all which is larger than itself. If a State and a county, in a given case, should be equal in extent of territory, and equal in number of inhabitants, in wit at, as a matter of principle, is the State better than the county? Would an exchange of names be an exchange of rights upon principle? On what rightful principle may a State, being not more than one-fiftieth part of the nation, in soil and population, break up the nation and then coerce a proportionally larger subdivision of itself, in the most arbitrary way? What mysterious right to play tyrant is conferred on a district of country, with its people, by merely calling it a State? Fellow-citizens, I am not asserting any thing; I am merely asking questions for you to consider. And now allow me to bid you farewell. MR. MAYOR AND FELLOW- CITIZENS: I have spoken but once before this in Cincinnati. That was a year previous to the late Presidential election. On that occasion, in a playful manner, but with sincere words, I addressed much of what I said to the Kentuckians. I gave my opinion that we, as Republicans, would ultimately beat them, as Democrats, but that they could postpone that result longer by nominating Senator Douglas for the Presidency than they could in any other way. They did net, in any true sense of the word, nominate Mr. Douglas, and the result has come certainly as soon as ever I expected. I also told them how I expected they would be treated after they should have been beaten; and I now wish to call their attention to what I then said upon that subject. I then said, "When we do as we say, beat you, you perhaps want to know what we will do with you. I will tell you, as far as T am authorized to speak for the opposition, what we mean to do with you. "We mean to treat you, as near as we possibly can, as Washington, Jefferson, and Madison treated you. We mean to leave you alone, and in no way to interfere with your institutions; to abide by all and every compromise of the Constitution; and, in a word, coming back to the original proposition, to treat you so far as degenerate men, if we have degenerated, may, according to the example of those noble fathers, WASHINGTON, JEFFERSON, and MADISON. We mean to remember that you are as good as we; that there is no difference between us, other than the difference of circumstances. We mean to recognize and bear in mind always that you have as good hearts in your bosoms as other people, or as we claim to have, and treat you accordingly. Fellow-citizens of Kentucky! friends! brethren, may I call you in my new position? I see no occasion, and feel no inclination to retract a word of this. If it shall not be made good, be assured the fault shall not be mine. MR. PRESIDENT AND MR. SPEAKER, AND GENTLEMEN OF THE GENERAL ASSEMBLY: It is true, as has been said by the President of the Senate, that very great responsibility rests upon me in the position to which the votes of the American people have called me. I am deeply sensible of that weighty responsibility. I cannot but know what you all know, that without a name, perhaps without a reason why I should have a name, there has fallen upon me a task such as did not rest even upon the Father of his Country; and so feeling, I cannot but turn and look for the support without which it will be impossible for me to perform that great task. I tarn, then, and look to the great American people, and to that God who Las never forsaken them. Allusion has been made to the interest felt in relation to the policy of the new Administration. 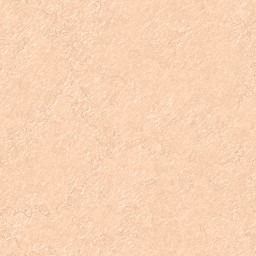 In this I have received from some a degree of	credit for having kept silence, and from others some depreciation. I still think that I was right. In the varying and repeatedly shifting scenes of the present, and without a precedent which could enable me to judge by the past, it has seemed fitting that before speaking upon the difficulties of the country, I should have gained a view of the whole field so as to be sure after all at liberty to modify and change the course of policy as future events may make a change necessary. I have not maintained silence from any want of real anxiety. It is a good thing that there is no more than anxiety, for there is nothing going wrong. It is a consoling circumstance that when we look out, there is nothing that really hurts anybody. We entertain different views upon political questions, but nobody is suffering any thing. This is a most consoling circumstance, and from it we may conclude that all we want is time, patience, and a reliance on that God who has never forsaken this people. Fellow-citizens, what I have said I have said altogether extemporaneously, and will now come to a close. I fear that the great confidence placed in my ability is unfounded. Indeed, I am sure it is. Encompassed by vast difficulties as I am, nothing shall be wanting on my part, if sustained by the American people and God. I believe the devotion to the Constitution is equally great on both sides of the river. It is only the different understanding of that instrument that causes difficulty. The only dispute on both sides is, " What are their rights?" If the majority should not rule, who should be the judge ? Where is such a judge to be found? We should all be bound by the majority of the American people if not, then the minority must control. Would that be right? Would it be just or generous? Assuredly not. I reiterate, that the majority should rule. If I adopt a wrong policy, the opportunity for condemnation will occur in four years' time. Then I can be turned out, and a better man with better views put in my place. He said he would not give them a speech, as he thought it more rare, if not more wise, for a public man to abstain from much speaking. He	expressed his gratitude and surprise at seeing so great a crowd and such boundless enthusiasm manifested in the night-time, and under such untoward circumstances, to greet so unworthy an individual as himself. This was undoubtedly attributable to the position which more by accident than by worth he had attained. He remarked further, that if all those whole-souled people whom he saw this evening before him, were for the preservation of the Union, he did not see how it could be in much danger. He had intended to say a few words to the people of Pittsburg the greatest manufacturing city of the United States upon such matters as they were interested in; but as he had adopted the plan of holding his tongue for the most part during the last canvass, and since his election, he thought he had perhaps better now still continue to hold his tongue. [Cries of "Go on," "go on."] Well, I am reminded that there is an Alleghany City as well as an Alleghany County, the former the banner town, and the latter the banner county, perhaps, of the world. I am glad to see both of them, and the good people of both. That I may not disappoint these, I will say a few words to you to-morrow as to the peculiar interests of Alleghany County. I most cordially thank His Honor Mayor Wilson, and the citizens of Pittsburg generally, for their flattering reception. I am the more grateful because I know that it is not given to me alone, but to the cause I represent, which clearly proves to me their good-will, and that sincere feeling is at the bottom of it. And here I may remark, that in every short address I have made to the people, in every crowd through which I have passed of late, some allusion has been made to the present distracted condition of the country. It is natural to expect that I should say something on this subject; but to touch upon it at all would involve an elaborate discussion of a great many questions and circumstances, requiring more time than I can at present command, and would, perhaps, unnecessarily commit me upon matters which have not yet fully developed themselves. The condition of the country is an extraordinary one, and fills the mind of every patriot with anxiety. It is my intention to give this subject all the consideration I possibly can before specially deciding in regard to it, so that when I do speak it may be as nearly right as possible. When I do speak, I hope I may say nothing in opposition to the spirit of the Constitution, contrary to the integrity of the	Union, or which will prove inimical to the liberties of the people, or to the peace of the whole country. And, furthermore, when the time arrives for me to speak on this great subject, I hope I may say nothing to disappoint the people generally throughout the country, especially if the expectation has been based upon any thing which I may have heretofore said. Notwithstanding the troubles across the river (the speaker pointing southwardly across the Monongahela, and smiling) there is no crisis but an artificial one. What 'is there now to warrant the condition of affairs presented by our friends over the river? Take even their own view of the questions involved, and there is nothing to justify the course they are pursuing. I repeat, then, there is no crisis, excepting such a one as may be gotten up at any time by turbulent men, aided by designing politicians. My advice to them, under such circumstances, is to keep cool. If the great American people only keep their temper on both sides of the line, the troubles will come to an end, and the question which now distracts the country will be settled, just as surely as all other difficulties of a like character which have originated in this Government have been adjusted. Let the people on both sides keep their self-possession, and just as other clouds have cleared away in due time, so will this great nation continue to prosper as heretofore. But, fellow-citizens, I have spoken longer on this subject than I intended at the outset. It is often said that the Tariff is the specialty of Pennsylvania. Assuming that direct taxation is not to be adopted, the Tariff question must be as durable as the Government itself. It is a question of national housekeeping. It is to the Government what replenishing the meal-tub is to the family. Every varying circumstance will require frequent modifications as to the amount needed, and the sources of supply. So far there is little difference of opinion among the people. It is only whether, and how far, the duties on imports shall be adjusted to favor home productions. In the home market that controversy begins. One party insists that too much protection oppresses one class for the advantage of another, while the other party argues that with all its incidents, in the long run, all classes are benefited. In the Chicago Platform there is a plank upon this subject, which should be a general law to the incoming Administration. We should do neither more nor less than we gave the people reason to believe we would when they gave us their votes. That plank is as I now read. That while providing revenue for the support of the General Government, by duties upon imports, sound policy requires such an adjustment of these imports as will encourage the development of the industrial interest of the whole country; and we commend that policy of national exchanges which secures to working-men liberal wages, to agriculture remunerative prices, to mechanics and manufacturers adequate reward	for their skill, labor, and enterprise, and to the nation commercial prosperity and independence. Mr. Lincoln resumed: As with all general propositions, doubtless there' will be shades of difference in construing this. I have by no means a thoroughly matured judgment upon this subject, especially as to details; some general ideas are about all. I have long thought to produce any necessary article at home which can be made of as good quality and with as little labor at home as abroad, would be better policy, at least by the difference of the carrying from abroad. In such a case, the carrying is demonstrably a dead loss of. labor. For instance, labor being the true standard of value, is it not plain that if equal labor gets a bar of railroad iron out of a mine in England, and another out of a mine in Pennsylvania, each can be laid down in a track at home cheaper than they could exchange countries, at least by the cost of carriage? If there be a present cause why one can be both made and carried cheaper in money price than the other can be made without carrying, that cause is an unnatural and injurious one, and ought naturally, if not rapidly, to be removed. The condition of the treasury at this time would seem to render an early revision of the "Tariff indispensable. The Morrill Tariff Bill, how pending before Congress, may or may not become a law. I am not posted as to its particular provisions, but if they are generally satisfactory, and the bill shall now pass, there will be an end of the matter for the present. If, however, it shall not pass, I suppose the whole subject will be one of the most pressing and important for the next Congress. By the Constitution, the Executive may recommend measures which he may think proper, and he may veto those he thinks improper, and it is supposed that he may add to these certain indirect influences to affect the action of Congress. My political education strongly inclines me against a very free use of any of these means by the Executive to control the legislation of the country. As a rule, I think it better that Congress should originate as well as perfect its measures without external bias. I, therefore, would rather recommend to every gentleman who knows he is to be a member of the next Congress to take an enlarged view, and inform himself thoroughly, so as to contribute his part to such an adjustment of the tariff as shall produce a sufficient revenue, and in its other bearings, so far as possible, be just and equal to all sections of the country, and all classes of the people. MR. CHAIRMAN AND FELLOW-CITIZENS OF CLEVELAND: We have been marching about two miles through snow, rain, and deep mud. The large numbers that have turned out under these circumstances testify that you are in earnest about something or other. But do I think so meanly of you as to suppose that that earnestness is about me personally? I would be doing you injustice to suppose it was. You have assembled to testify your respect to the Union, and the Constitution and the laws. And here let me state that it is with you, the people, to advance the great cause of the Union and the Constitution, and not with any one man. It rests with you alone. This fact is strongly impressed on my mind at present. In a community like this, whose appearance testifies to their intelligence, I am convinced that the cause of liberty and the Union can never be in danger. Frequent allusion is made to the excitement at present existing in our national politics, and it is as well that I should also allude to it here. I think that there is no occasion for any excitement. The crisis, as it is called, is altogether an artificial crisis. In all parts of the nation there are differences of opinion on politics. There are differences of opinion even here. You did not all vote for the person who now addresses you. What is happening now will not hurt those who are further away from here. Have they not all their rights now as they ever have had? Do not they have their fugitive slaves returned now as ever? Have they not the same Constitution that they have lived under for seventy odd years? Have they not a position as citizens of this common country, and have we any power to change that position? [Cries of "No."] What, then, is the matter with them? Why all this excitement? "Why all these complaints? As I said before, this crisis is all artificial! It has no foundation in fact. It was not "argued up," as the saying is, and cannot therefore be argued down. Let it alone, and it will go down of itself. [Laughter.] Mr. Lincoln said that they must be content with but a few words from him. He was very much fatigued, and had spoken so much that he was already hoarse. Ho thanked them for the cordial and magnificent reception they had given him. Not less did he thank them, for the votes they gave him last fall; and quite as much he thanked them for the efficient aid they had given the cause which he represented a cause which he would say was a good one. He had one more word to say. He was given to understand that this reception was tendered not only by his own party supporters, but by men of all parties. This is as it should be. If Judge Douglas had been elected, and had been here, on his way to Washington, as I am to-night, the Republicans should have joined his supporters in welcoming him	just as Ms friends have joined with mine to-night. If all do not join now to save the good old ship of the Union on this voyage, nobody will have a chance to pilot her on another voyage. He concluded by thanking all present for the devotion they had shown to the cause of the Union. On the morning of the 16th the Presidential party left Cleveland for Buffalo. At Erie, where they dined, loud calls were made upon Mr. Lincoln for a speech, in response to which he made a few remarks, excusing himself for not expressing his opinions on the exciting questions of the day. He trusted that when the time for speaking should come, he should find it necessary to say nothing not in accordance with the Constitution, as well as with the interests of the people of the whole country. At Northeast Station he took occasion to state that during the campaign he had received a letter from a young girl of the place, in which he was kindly admonished to do certain things, and among others to let his whiskers grow; and, as he had acted upon that piece of advice, he would now be glad to welcome his fair correspondent, if she was among the crowd. In response to the call a lassie made .her way through the crowd, was helped on the platform, and was kissed by the President. MR. MAYOR AND FELLOW-CITIZENS OF BUFFALO AND THE STATE OF NEW YORK: I am here to thank you briefly for this grand reception given to me, not personally, but as the representative of our great and beloved country. [Cheers.] Your worthy Mayor has been pleased to mention, in his address to me, the fortunate and agreeable journey which I have had from home, only it is a rather circuitous route to the Federal Capital. I am very happy that he was enabled in truth to congratulate myself and company on that fact. It is true we have had nothing thus far to mar the pleasure of the trip. We have not been met alone by those who assisted in giving the election to me; I say not alone by them, but by the whole population of the country through which we have passed. This is as it should be. Had the election fallen to any other of the distinguished	candidates instead of myself, under the peculiar circumstances, to say the least, it would have been proper for all citizens to have greeted him as you now greet me. It is an evidence of the devotion of the whole people to the Constitution, the Union, and the perpetuity of the liberties of this country. [Cheers.] I am unwilling on any occasion that I should be so meanly thought of as to have it supposed for a moment that these demonstrations are tendered to me personally. They are tendered to the country, to the institutions of the country, and to the perpetuity of the liberties of the country, for which these institutions were made and created. .Your worthy Mayor has thought fit to express the hope that I may be able to relieve the country from the present, or, I should say, the threatened difficulties. I am sure I bring a heart true to the work. [Tremendous applause.] For the ability to perform it, I must trust in that Supreme Being who has never forsaken this favored land, through the instrumentality of this great and intelligent people. Without that assistance I shall surely fail; with it, I cannot fail. When we speak of threatened difficulties to the country, it is natural that it should be expected that something should be said by myself with regard to particular measures. Upon more mature reflection, however and others will agree with me that, when it is considered that these difficulties are without precedent, and never have been acted upon by any individual situated as I am, it is most proper I should wait and see the developments, and get all the light possible, so that when I do speak authoritatively, I may be as near right as possible. [Cheers.] When I shall speak authoritatively, I hope to say nothing inconsistent with the Constitution, the Union, the rights of all the States, of each State, and of each section of the country, and not to disappoint the reasonable expectations of those who have confided to me their votes. In this connection allow me to say that you, as a portion of the great American people, need only to maintain your composure, stand up to your sober convictions of right, to your obligations to the Constitution, and act in accordance with those sober convictions, and the clouds which now arise in the horizon will be dispelled, and we shall have a bright and glorious future; and when this generation has passed away, tens of thousands will inhabit this country where only thousands inhabit it now. I do not propose to address you at length; I have no voice for it. Allow me again to thank you for this magnificent reception, and bid you farewell. LADIES AND GENTLEMEN: I see you have erected a very fine and handsome platform here for me, and I presume you expected me to speak from it. If I should go upon it, you would imagine that I was about to deliver you a much longer speech than I am. I wish you to understand that I mean no discourtesy to you by thus declining. I intend discourtesy to no one. But I wish you to understand that, though I am unwilling to go upon this platform, you are not at liberty to draw any inferences concerning any other platform with which my name has been or is connected. [Laughter and applause.] I wish you long life and prosperity individually, and pray that with the perpetuity of those institutions under which we have all so long lived and prospered, our happiness may be secured, our future made brilliant, and the glorious destiny of our country established forever. I bid you a kind farewell. MR. MAYOR: I can hardly appropriate to myself the flattering terms in which you communicate the tender of this reception, as personal to myself. I most gratefully accept the hospitalities tendered to me, and will not detain you or the audience with any extended remarks at this time. I presume that in the two or three courses through which I shall have to go, I shall have to repeat somewhat, and I will therefore only repeat to you my thanks for this kind reception. MR. GOVERNOR: I was pleased to receive an invitation to visit the capital of the great Empire State of the nation, on my way to the Federal Capital, and I now thank you, Mr. Governor, and the people of this capital, and the people of the State of New York, for this most hearty and magnificent welcome. If I am not at fault, the great Empire State at this time contains a greater population than did the United States of America at the time she achieved her national independence. I am proud to he invited to pass through your capital and meet them, as I now have the honor to do. I am notified by your Governor that this reception is given without distinction of party. I accept it the more gladly because it is so. Almost all men in this country, and in any country where freedom of thought is tolerated, attach themselves to political parties. It is but ordinary charity to attribute this to the fact that in so attaching himself to the party which his judgment prefers, the citizen believes he thereby promotes the best interests of the whole country; and when an election is passed, it is altogether befitting a free people that, until the next election, they should be as one people. The reception you have extended to me to-day is not given to me personally. It should not be so, but as the representative for the time being of the majority of the nation. If the election had resulted in the selection of either of the other candidates, the same cordiality should have been extended to him as is extended to me this day, in testimony of the devotion of the whole people to the Constitution and the whole Union, and of their desire to perpetuate our institutions, and to hand them down in their perfection to succeeding generations. I have neither the voice nor the strength to address you at any greater length. I beg you will accept my most grateful thanks for this devotion not to me, but to this great and glorious free country. MR. MAYOR AND CITIZENS OF TROY: I thank you very kindly for this great reception. Since I left my home it has not been my fortune to meet	an assemblage more numerous and more orderly than this. I am the more gratified at this mark of your regard, since you assure me it is tendered, not to the individual, but to the high office you have called me to fill. I have neither strength nor time to make any extended remarks, and I can only repeat to you my sincere thanks for the kind reception you have thought proper to extend to me. FELLOW-CITIZENS: I see that you have provided a platform, but I shall have to decline standing on it. [Laughter and applause.] The superintendent tells me I have not time during our brief stay to leave the train. 1 had to decline standing on some very handsome platforms prepared for me yesterday. But I say to you, as I said to them, you must not on this account draw the inference that I have any intention to desert any plat form I have a legitimate right to stand on. I do not appear before you for the purpose of making a speech. I come only to see you, and to give you the opportunity to see me; and I say to you, as I have before said to crowds where there are so many handsome ladies as there are here, I think I have decidedly the best of the bargain. I have only, therefore, to thank you most cordially for this kind reception, and bid you all farewell. FELLOW-CITIZENS: It is altogether impossible I should make myself heard by any considerable portion of this vast assemblage; but, although I appear before you mainly for the purpose of seeing you, and to let you see, rather than hear me, I cannot refrain from saying that I am highly gratified as much here, indeed, under the circumstances, as I have been anywhere on my route to witness this noble demonstration made, not in honor of an individual, but of the man who at this time humbly, but earnestly, represents the majesty of the nation. This reception, like all others that have been tendered to me, doubtless emanates from all the political parties, and not from one alone. As such I accept it the more gratefully, since it indicates an earnest desire on the part of the whole people, without regard to political differences, to save not the country, because the country will save itself but to save the institutions of the country those institutions under which, in the last three-quarters of a century, we have grown to be a great, an intelligent, and a happy people the greatest, the most intelligent, and the happiest people in the world. These noble manifestations indicate, with unerring certainty, that the whole people are willing to make common cause for this object; that if, as it ever must be, some have been successful in the recent election, and some have been beaten if some are satisfied, and some are dissatisfied, the defeated party are not in favor of sinking the ship, but are desirous of running it through the tempest in safety, and willing, if they think the people have committed an error in their verdict now, to wait in the hope of reversing it, and setting it right next time. I do not say that in the recent election the people did the wisest thing that could have been done; indeed, I do not think they did; but I do say, that in accepting the great trust committed to me, which I do with a determination to endeavor to prove worthy of it, I must rely upon you, upon the people of the whole country, for support; and with their 'sustaining aid, even I, humble as I am, cannot fail to carry the ship of State safely through the storm. LADIES AND GENTLEMEN: I have but a moment to stand before you, to listen to and return your kind greeting. I thank you for this reception, and for the pleasant manner in which it is tendered to me, by our mutual friend. I will say in a single sentence, in regard to the. difficulties that lie before me and our beloved country, that if I can only be as generously and unanimously sustained as the demonstrations I have witnessed indicate I shall be, I shall not fail; but without your sustaining hands I am sure that neither I, nor any other man, can hope to surmount these difficulties. I trust that in the course I shall pursue I shall be sustained, not only by the party that elected me, but by the patriotic people of the whole country. FELLOW-CITIZENS: I have stepped before you merely in compliance with what appears to be your wish, and not with the purpose of making a speech. I do not propose making a speech this afternoon. I could not be heard by any but a small fraction of you, at best; but, what is still worse than that, I have nothing just now to say that is worthy of your tearing. [Applause.] I beg you to believe that I do not now refuse to address you from any disposition to disoblige you, but to the contrary. But, at the same time, I beg of you to excuse me for the present. MR. CHAIRMAN AND GENTLEMEN: I am rather an old man to avail myself of such an excuse as I am now about to do. Yet the truth is so distinct, and presses itself so distinctly upon me, that I cannot well avoid it and that is, that I did not understand when I was brought into this room that I was brought here to make a speech. It was not intimated to me that I was brought into the room where DANIEL WEBSTER and HENRY CLAY had made speeches, and where, in my position, I might be expected to do something like those men, or do something worthy of myself or my audience. I, therefore, will beg you to make very great allowance for the circumstances in which I have been by surprise brought before you. Now, I have been in the habit of thinking and speaking sometimes upon political questions that have for some years past agitated the country; and, if I were disposed to do so, and we could take up some one of the issues, as the lawyers call them, and I were called upon to make an argument about it to the best of my ability, I could do so without much preparation. But that is not what you desire to be done here to-night. I have been occupying a position since the Presidential election of silence, of avoiding public freaking, of avoiding public writing. I have been doing so, because I thought, upon full consideration, that was the proper course for me to take. [Great applause.] I am brought before you now, and required to make a speech, when you all approve more than any thing else of the fact that I have been keeping silence. [Great laughter, cries of "Good," and applause.] And now it seems to me that the response you give to that remark ought to justify me in closing just here. [Great laughter.] I have not kept silence since the Presidential election from any party wantonness, or from any indifference to the anxiety that pervades the minds of men about the aspect of the political affairs of this country. I have kept silence for the reason that I supposed it was peculiarly proper that I should do so until the time came when, according to the custom of the country, I could speak officially. A voice The custom of the country? MR. LINCOLN: As Mayor of New. York, it becomes my duty to extend to you an official welcome in behalf of the Corporation. In doing so, permit me to say, that this city has never offered hospitality to a man clothed with more exalted powers, or resting under graver responsibilities, than those which circumstances have devolved upon yon. Coming into office with a dismembered Government to reconstruct, and a disconnected and hostile people to reconcile, it will require a high patriotism, and an elevated comprehension of the whole country and its varied interests, opinions, and prejudices, to so conduct public affairs as to bring it back again to its former harmonious, consolidated, and prosperous condition. If I refer to this topic, sir, it is because New York is deeply interested. The present political divisions have sorely afflicted her people. All her material interests are paralyzed. Her commercial greatness is endangered. She is the child of the American Union. She has grown up under its maternal care, and been fostered by its paternal bounty, and we fear that if the Union dies, the present supremacy of New York may perish with it. To you, therefore, chosen under the forms of the Constitution as the head of the Confederacy, we look for a restoration of fraternal relations between the States only to be accomplished by peaceful and conciliatory means, aided by the wisdom of Almighty God. ME. MAYOR: I thank you for this reception at the city of Newark. With regard to the great work of which you speak, I will say that I bring to it a heart filled with love for my country, and an honest desire to do what is right. I am sure, however, that I have not the ability to do any thing unaided of God, and that without his support, and that of this free, happy, prosperous, and intelligent people, no man can succeed in doing that the importance of which we all comprehend. Again thanking you for the reception you have given me, I will now bid you farewell, and proceed upon my journey. MR. PRESIDENT AND GENTLEMEN OF THE SENATE OF THE STATE OF NEW JERSEY: I am very grateful to you for the honorable reception of which I have been the object. I cannot but remember the place that New Jersey holds in our early history. In the early Revolutionary struggle few of the States among the Old Thirteen had more of the battle-field of the country within their limits than old New Jersey. May I be pardoned if, upon this occasion, I mention that away back in my childhood, the earliest days of my being able to read, I got hold of a small book, such a one as few of the younger members have ever seen, " WEEM'S Life of Washington." I remember all the accounts there given of the battlefields and struggles for the liberties of the country, and none fixed themselves upon my imagination so deeply as the struggle here at Trenton, New Jersey. The crossing of the river; the contest with the Hessians; the great hardships endured at that time, all fixed themselves on my memory more than any single Revolutionary event; and you all know, for you have all been boys, how these early impressions last longer than any others. I recollect thinking then, boy even though I was, that there must have been something more than common that these men struggled for. I am exceedingly anxious that that thing which they struggled for; that something even more than National Independence; that something that held out a great promise to all the people of the world to all time to	come I am exceedingly anxious that this Union, the Constitution, and the liberties of the people shall be perpetuated in accordance with the original idea for which that struggle was made, and I shall be most happy indeed if I shall be an humble instrument in the hands of the Almighty, and of this, his most chosen people, as the chosen instrument also in the hands of the Almighty for perpetuating the object of that great struggle. Yon give me this reception, as I understand, without distinction of party. I learn that this body is composed of a majority of gentlemen who, in the exercise of their best judgment in the choice of a Chief Magistrate, did not think I was the man. 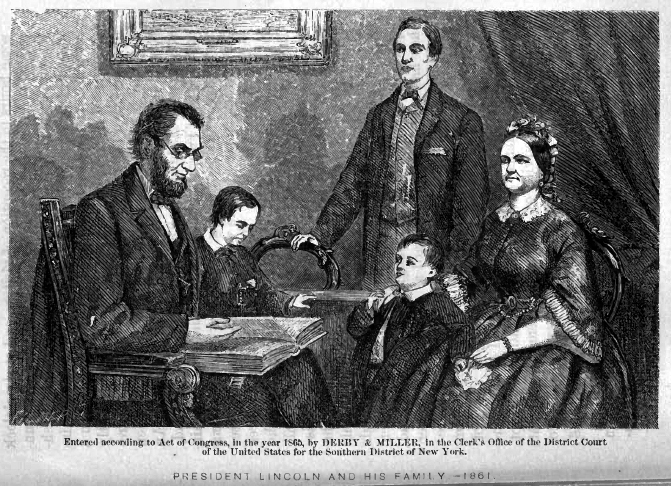 I understand, nevertheless, that they came forward here to greet me as the constitutional President of the United States as citizens of the United States to meet the man who, for the time being, is the representative man of the nation united by a purpose to perpetuate the Union and liberties of the people. As such, I accept this reception more gratefully than I could do did I believe it was tendered to me as an individual. MR. SPEAKER AND GENTLEMEN: I have just enjoyed the honor of a reception by the other branch of this legislature, and I return to you and them my thanks for the reception which the people of New Jersey have given through their chosen representatives to me as the representative, for the time being, of the majesty of the people of the United States. I appropriate to myself very little of the demonstrations of respect with which I have been greeted. I think little should be given to any man, but that it should be a manifestation of adherence to the Union and the Constitution. I understand myself to be received here by the representatives of the people of New Jersey, a majority of whom differ in opinion from those with whom I have acted. This manifestation is, therefore, to be regarded by me as expressing their devotion to the Union, the Constitution, and the liberties of the people. You, Mr. Speaker, have well said that this is a time when the bravest and wisest look with doubt and awe upon the aspect presented by our national affairs. Under these circumstances, you will readily see why 1 should not speak in detail of the course I shall deem it best to pursue. It is proper that I should avail myself of all the information and all the time at my command, in order that when the time arrives in which I must speak officially, I shall be able to take the ground which I deem the best and safest, and from which I may have no occasion to swerve. I shall endeavor to take the ground I deem most just to the North, the East, the West, the South, and the whole country. I take it, I hope, in good temper, certainly with no malice towards any section. I shall do all that may be in my power to promote a peaceful settlement of all our difficulties. The man does not live who is more devoted to peace than I am. [Cheers.] None who would do more to preserve it, but it may be necessary to put the foot down firmly. [Here the audience broke out into cheers so loud and long, that for some moments t was impossible to hear Mr. Lincoln's voice.] And if I do my duty and lo right, you will sustain me, will you not? [Loud cheers, and cries of ' Yes, yes, we will."] Received, as I am, by the members of a legislature, the majority of whom do not agree with me in political sentiments, I trust that I may have their assistance in piloting the ship of State through this voyage, surrounded by perils as it is; for if it should suffer wreck now, there will be no pilot ever needed for another voyage. Gentlemen, I have already spoken longer than I intended, and must beg leave to stop here. I have been invited by your representatives to the Legislature to visit this, the capital of your honored State, and in acknowledging their kind invitation, compelled to respond to the welcome of the presiding officers of each body, and I suppose they intended I should speak to you through them, as they are the representatives of all of you; and if I was to speak again here, I should only have to repeat, in a great measure, much that I have said, which would be disgusting to my friends around me who have met here. I have no speech to make, but merely appear to see you and let you look at me; and as to the latter, I think I have greatly the best of the bargain. [Laughter.] My friends, allow me to bid you farewell. MR. MAYOR AND FELLOW-CITIZENS OF PHILADELPHIA: I appear before you to make no lengthy speech, but to thank you for this reception. The reception you have given me to-night is not to me, the man, the individual, but to the man who temporarily represents, or should represent, the majesty of the nation. [Cheers.] It is true, as your worthy Mayor has said, that there is anxiety amongst the citizens of the United States at this time. I deem it a happy circumstance that this dissatisfied position of our fellow-citizens does not point us to any thing in which they are being injured, or about to be injured; for which reason, I have felt all the while justified in concluding that the crisis, the panic, the anxiety of the country at this time, is artificial. If there be those who differ with me upon this subject, they have not pointed out the substantial difficulty that exists. I do not mean to say that an artificial panic may not do considerable harm; that it has done such I do not deny. The hope that has	been expressed by your Mayor, that I may be able to restore peace, harmony, and prosperity to the country, is most worthy of him; and happy, indeed, will I be if I shall be able to verify and fulfil that hope. [Tremendous cheering.] I promise you, in all sincerity, that I bring to the work a sincere heart. Whether I will bring a head eaual to that heart will be for future times to determine. It were useless for me to speak of details of plans now; I shall speak officially next Monday week, if ever. If I should not speak then, it were useless for me to do so now. If I do speak then, it is useless for me to do so now. When I do speak, I shall take such ground as I deem best calculated to restore peace, harmony, and prosperity to the country, and tend to the perpetuity of the nation and the liberty of these States and these people. Your worthy Mayor has expressed the wish, in which I join with him, that it were convenient for me to remain in your city long enough to consult your merchants and manufacturers; or, as it were, to listen to those breathings rising within the consecrated walls wherein the Constitution of the United States, and, I will add, the Declaration of Independence, were originally framed and adopted. [Enthusiastic applause.] I assure you and your Mayor that I had hoped on this occasion, and upon all occasions during my life, that-I shall do nothing inconsistent with the teachings of these holy and most sacred walls. I never asked any thing that does not breathe from those walls. All my political warfare has been in favor of the teachings that came forth from these sacred walls. May my right hand forget its cunning, and my tongue cleave to the roof of my mouth, if ever I prove false to those teachings. Fellow-citizens, I have addressed you longer than I expected to do, and now allow me to bid you good-njght. My friends, this is wholly an unexpected speech, and I did not expect to be called upon to say a word when I came here. I supposed it was merely to do something towards raising the flag I may, therefore, have said something indiscreet. [Cries of " No, no."] I have said nothing but what I am willing to live by, and, if it be the pleasure of Almighty God, die by. LADIES AND GENTLEMEN OF OLD LANCASTER: I appear not to make a speech. I have not time to make a speech at length, and not strength to make them on every occasion; and worse than all, I have none to make. There is plenty of matter to speak about in these times, but it is well known that the more a man speaks the less he is understood the lucre he says one thing, the more his adversaries contend he meant something else. I shall soon have occasion to speak officially, and then I will endeavor to put my thoughts just as plain as I can express myself true to the Constitution and Union of all the States, and to the perpetual liberty of all the people. Until I so speak, there is no need to enter upon details, In conclusion, I greet you most heartily, and bid you an affectionate farewell. I appear before you only for a very few, brief remarks, in response to what has been said to me. I thank you most sincerely for this reception, and the generous words in which support has been promised me upon this occasion. I thank your great Commonwealth for the overwhelming support it recently gave, not me personally, but the cause which I think a just one, in the late election. [Loud applause.] Allusion has been made tp the fact the interesting fact, perhaps, we should say that I for the first time appear at the Capital of the great Commonwealth of Pennsylvania upon the birthday of the Father of his Country, in connection with that beloved anniversary connected with the history of this country. I have already gone through one exceedingly interesting scene this morning in the ceremonies at Philadelphia. 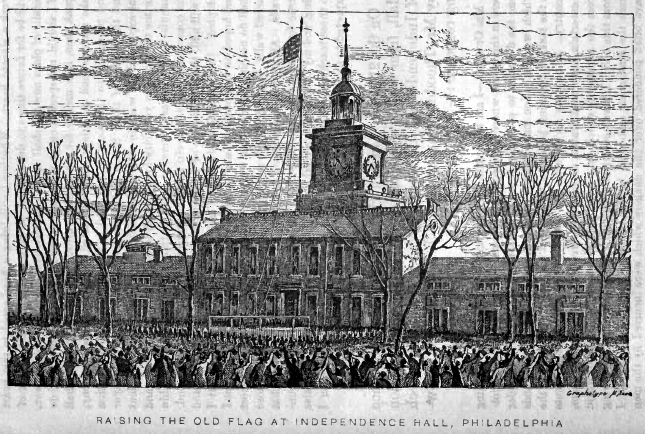 Under the high conduct of gentlemen there, I was for the first time allowed the privilege of standing in old Independence Hall [enthusiastic cheering], to have a few words addressed to me there, and opening up to me an opportunity of expressing, with much regret, that I had not more time time to express something of my own feelings, excited by the occasion, somewhat to harmonize and give shape to the feelings that had been really the feelings of my whole life. Besides this, our friends there had provided a magnificent flag of the country. They had arranged it so that I was given the honor of arising it to the head of its staff. [Applause.] And when it went up, I was pleased that it went to its place by the strength of my own feeble arm, when, according to the arrangement, the cord was pulled, and it floated gloriously to the wind, without an accident, in the light, glowing sunshine of the morning. I could not help hoping that there was, in the entire success of that beautiful ceremony, at least something of an omen of what is to come. [Loud applause.] How could I help feeling then as I often have felt? In the whole of that proceeding I was a very humble instrument. I had not provided the flag; I had not made the arrangements for elevating it to its place; I had applied but a very small portion of my feeble strength in raising it. In the whole transaction I was in the hands of the people who had arranged it, and if I can have the same generous co-operation of the people of the nation, I think the flag of our country may yet be kept flaunting gloriously. [Loud, enthusiastic, and continued cheers.] I recur for a moment but to repeat some words uttered at the hotel, in regard to what has been said about the military support which the General Government may expect from the Commonwealth of Pennsylvania in a proper emergency. To guard against any possible mistake do I recur to this. It is not with any pleasure that I contemplate the possibility that a necessity may arise in this country for the use of the military arm. [Applause.] While I am exceedingly gratified to see the manifestation upon your streets of your military force here, and exceedingly gratified at your promises here to use that force upon a proper emergency while I make these acknowledgments I desire to repeat, in order to preclude any possible misconstruction, that I do most sincerely hope that we shall have no use for them. [Applause.] That it will never become their duty to shed blood, and most especially never to shed fraternal blood. I promise that, so far as I may have wisdom to direct, if so painful a result shall in any-wise be brought about, it shall be through no fault of mine. [Cheers.] 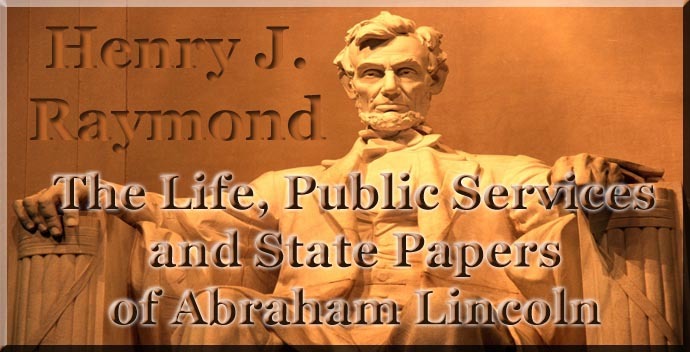 Allusion has also been made by one of your honored speakers to some remarks recently made by myself at Pittsburg, in regard to what is supposed to be the especial interest of this great Commonwealth of Pennsylvania. I now wish only to say, in regard to that matter, that the few remarks which I uttered on that occasion were rather carefully worded. I took pains that they should be so. I have seen no occasion since to add to them, or subtract from them. I leave them precisely as they stand [applause], adding only now, that I am pleased to have an expression from you, gentlemen of Pennsylvania, significant that they are satisfactory to you. And now, gentlemen of the General Assembly of the Commonwealth of Pennsylvania, allow me to return you again my most sincere thanks. After the delivery of this address, Mr. Lincoln devoted some hours to the reception of visitors, 'and at six o'clock retired to his room. The next morning the whole country was surprised to learn that he had arrived in Washington twelve hours sooner than he had originally intended. His sudden departure proved to have been a measure of precaution for which events subsequently disclosed afforded a full justification. For some time previous to his departure from home, the rumor had been current that he would never reach the Capital alive. An attempt was made on the Toledo and Western Railroad, on the 11th of February, to throw from the track the train on which he was journeying, and just as he was leaving Cincinnati a hand grenade was found to have been secreted on board the cars. These and other circumstances led to an organized and thorough investigation, under the direction of a police detective, carried on with great skill and perseverance at Baltimore, and which resulted in disclosing the fact that a small gang of assassins, under the leadership of an Italian who assumed the name of Orsini, had arranged to take his life during his passage through Baltimore. General Scott and Mr. Seward had both been apprised of the same fact through another source, and they had sent Mr. F. W. Seward as a special messenger to Philadelphia, to meet the President-elect there, previous to his departure for Harrisburg, and give him notice of these circumstances. Mr. Lincoln did not deviate from the programme he had marked out for himself, in consequence of these communications; except that, under the advice of friends, he deemed it prudent to anticipate by one train the time he was expected to arrive in Washington. He reached there on the morning of Saturday, the 23d. MB. MAYOR: I thank you, and through you the municipal authorities of this city who accompany you, for this -welcome. And as it is the first	time in my life, since the present phase of politics has presented itself in this country, that I have said any thing publicly within a region of country where the institution of slavery exists, I will take this occasion to say, that I think very much of the ill-feeling that has existed and still exists between the people in the sections from which I came and the people here, is dependent upon a misunderstanding of one another. I therefore avail myself of this opportunity to assure you, Mr. Mayor,. and all the gentlemen present, that I have not now, and never have had, any other than as kindly feelings towards you as the people of my own section. I have not now, and never have had, any disposition to treat you in any respect otherwise than as my own neighbors. I have not now any purpose to withhold from you any of the benefits of the Constitution, under any circumstances, that I would not feel myself constrained to withhold from my own neighbors;. and I hope, in a word, that when we shall become better acquainted and I say it with great confidence we shall like each other the more. I thank you for the kindness of this reception. MY FRIENDS: I suppose that I may take this as a compliment paid to me, and as such please accept my thanks for it. I have reached this City of Washington under circumstances considerably differing from those under which any other man has ever reached it. I am here for the purpose of taking an official position amongst the people, almost all of whom were politically opposed to me, and are yet opposed to me, as I suppose. I propose no lengthy address to you. I only propose to say, as I did on yesterday, when your worthy Mayor and Board of Aldermen called upon me, that I thought much of the ill feeling that has existed between you and the people of your surroundings and that people from among whom I came, has depended, and now depends, upon a misunderstanding. I hope that, if things shall go along as prosperously as I believe we all desire they may, I may have it in my power to remove something of this misunderstanding; that I may be enabled to convince you, and the people of your section of the country, that we regard you as yi all things our equals, and in all things entitled to the same respect and the same treatment that we claim for ourselves; that we are in no wise disposed, if it were in our power, to oppress you, to deprive you of any of your rights under the Constitution of the United States, or even narrowly to split hairs with you in regard to these rights, but are determined to give you, as far as lies in our hands, all your rights under the Constitution not	grudgingly, but fully and fairly. [Applause.] I hope that, by thus dealing with you, we will become better acquainted, and be better friends. And now, my friends, with these few remarks, and again returning my thanks for this compliment, and expressing my desire to hear a little more of your good music, I bid you good-night. This closed Mr. Lincoln's public speeches down to the date of his inauguration.